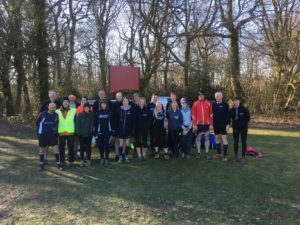 Sunday 3rd February saw the final race in the KFL Cross Country League at Blean Woods hosted and organised by the Harriers. It was a chilly start but luckily full of sunshine and plenty of frozen puddles and quality mud thrown in for good measure. The Harriers have had another successful season with a regular turnout of over 20 at each race. Overall Harriers came 6th in the combined league, 2nd in the female standings and 8th in the men’s race, with 18 teams taking part in the league. We had 3 ladies come in the top 20 in the league Claire Pluckrose (9), Jo Norrington (12) and Barbara Wenman (18), with a special mention to Barbara Wenman and Tina Jones who ran in all 7 races across the season. Well done to Simon Jones who came third in the overall men’s race, and to Adam Elston and Wim Van Vuuren who came 35 and 41 respectively. Again special mentions to Steve Clark, Steve Reynolds, Jon Vann, Bob Davison, Matthew Northover and Gerry Reilly who ran in all 7 races. Well done to all who turned out across the races. There were some tough conditions to run in but once again we have shown the league we are still tough competitors.